After the Fiat 500 tour, we hopped a train to Lucca for a quick overnight. We stayed at Guest Apartment Margherita and can’t say enough things about how wonderful our hosts were. Because it’d been raining, Roberto met us at the train to drive us the half kilometer into town. The B&B is gorgeous and we felt so incredibly welcomed. 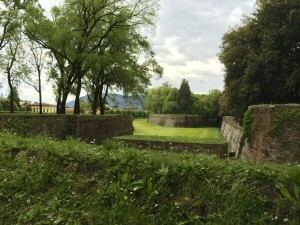 We arrived in Lucca with no real plans, so we set out for a brief wander. I’d done a bit of restaurant research (on tripadvisor.it of course) and had one place in mind. A few minutes later, he’d found a spot for us, and we were treated to our best meal of the trip. The place is a family affair, with seasonal food and a great atmosphere. Gnocchi with arugala pesto and walnuts, ravioli with spinach and walnut cream sauce, lamb, porchini. Fantastic! Saturday (today, hey look, I’m finally caught up!) we spent the day wandering Lucca, poking in shops, and doing not much of anything. 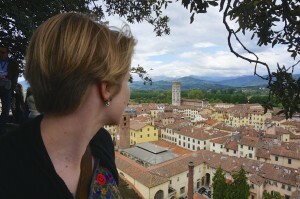 Kat really loved the town – it’s a nice break from Florence. 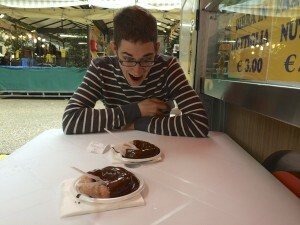 Oh also, there were these donut-like things covered in homemade nutella, fried fresh to order. In the evening we caught a train back to Florence, made some dinner, and .. caught up on blogging. I think I just went recursive.